Reducing the number of large warships and adding frigates could help to reduce the cost of a larger fleet. A 9,000-ton-displacement Arleigh Burke-class destroyer costs more than $2 billion. A frigate, displacing just 5,000 tons, should cost around $1 billion, according to the Navy. But the frigate still could carry many of the same weapons and sensors that a destroyer does, although somewhat fewer of them. According to a Navy document that the Congressional Research Service obtained, the frigate will come armed with a 57-millimeter gun, a 32-cell vertical missile-launcher for SM-2 Block IIIC and Evolved Sea Sparrow missiles, a 21-round point-defense Rolling Airframe Missile launcher and eight launchers for over-the-horizon anti-ship missiles. Its radar and combat system will be a smaller version of the Aegis system that equips the Navy's destroyers and cruisers. The frigate will embark an MH-60R helicopter and an MQ-8C drone. 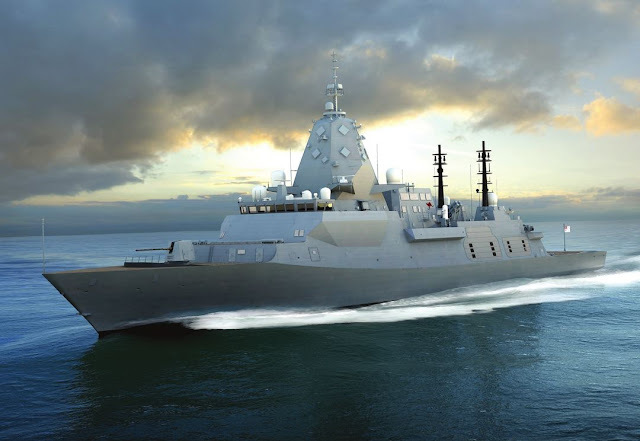 That weapons and sensor suite should give the frigate the ability to engage enemy aircraft, ships and submarines at a distance of 100 miles or more. Over time, the ship could gain additional weaponry. The Navy document refers to potential upgrades for the frigate including a 150-kilowatt laser and an anti-submarine missile, which could be a rocket-boosted torpedo similar in concept to the defunct ASROC missile. But the SM-2 Block IIIC, of which the frigate could carry 32, could be the new ship's most potent weapon. The Block IIIC replaces the semi-active radar-homing seeker on older SM-2s with the active radar-homing seeker of the SM-6 missile. The SM-6's seeker itself is a derivative of the Advanced Medium-Range Air-to-Air Missile. With a semi-active missile, the launching ship must use its own radar to guide the missile through most of its flight. An active missile has its own, tiny radar, allowing the ship to launch and leave, thus protecting it from retaliatory strikes. The SM-2 Block IIIC can do much more than just shoot down aircraft. With small tweaks to the seeker, the Navy already has given the SM-6 and SM-2 Block IIIC missiles anti-ship capability. Additional tweaks could allow the SM-6 -- and by extension the SM-2 Block IIIC -- to hit targets on land. The new frigate also could function as a command vessel for robotic vessels, using Link 11 and Link 16 data links, satellite communications and Network Tactical Common Data Link to help the unmanned vessels to navigate and also to authorize them to fire weapons. The Navy soon could select a shipyard to build the new class of frigate starting in 2020. "All shipyards have agreed that they can give us the lethality we need," Merz said. We get less than half the payload, 4.5K tons lighter and yet the cost is still half that of a Burke Class? That don't seem like much of a bargain. Which is better. 20 Frigates or 10 more Burke's? Distributed operations sounds good but I'm not seeing the economics of this thing actually playing out to our advantage. Are we chasing a fleet number or are we going for a more lethal, survivable fleet that can go toe to toe with the Chinese? If its the latter than we need more Burkes, not Frigates (we already have a mess of LCS). If its the former then I need to know why that makes sense. 275 ships that are in fighting trim with well trained sailors manning them vs 350 that are tin cans? It all boils down to which is better. Quantity or Quality? That's what the Navy has to decide.